CHIANG MAI, THAILAND, 8th February 2019 – Harley-Davidson (Thailand) and Richco Harley-Davidson Chiang Mai are accelerating into 2019 with an exciting demo tour across the kingdom. 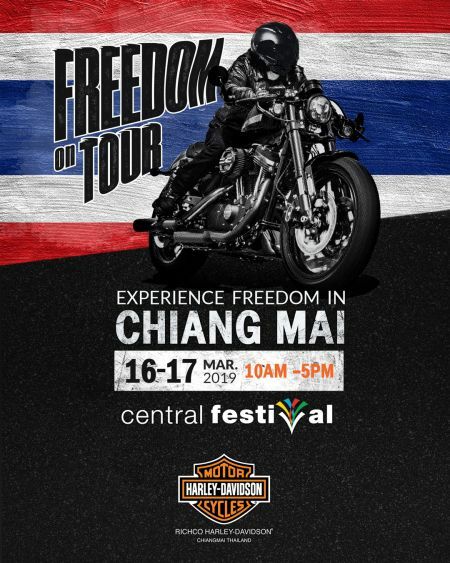 Known as Freedom on Tour, the demo tour takes place on weekends, and brings the range of 2019 Sportster™, Softail™ & Touring motorcycle families for test ride in Thailand. chapter in the story of the legendary brand of premium motorcycles. Bob™114, Fat Boy™ 114 and Touring model. experience the Harley-Davidson brand and build the next generation of Harley-Davidson riders.